Chinese Premier Li Keqiang (L) and Pakistani President Asif Ali Zardari (R) leave after a signing of agreements ceremony at the presidential palace in Islamabad on May 22, 2013. ISLAMABAD — China’s Prime Minister Li Keqiang says his country is committed to consolidate its “traditional friendship” with Pakistan and strengthen strategic cooperation. The Chinese leader spoke Wednesday in Islamabad after a visit to India. Chinese Premier Li Keqiang landed in Islamabad under tight security and his plane was escorted by fighter jets as soon as it entered Pakistani air space. Authorities suspended mobile phone networks across the capital city for several hours and deployed security forces at key locations to discourage any subversive acts. The unprecedented security arrangements follow a rise in violence blamed on Islamist militants. China's prime minister has arrived in Pakistan where he is seeking to strengthen cooperative ties between the two countries. Trade between China and Pakistan hit $12 billion last year and both sides want to raise that to $15 billion in the next two to three years. The Chinese leader later addressed a ceremony hosted by President Asif Ali Zardari at the presidential office where Prime Minister-elect Nawaz Sharif and the country’s military leadership were also present. Premier Li praised the decades old friendship between China and Pakistan as “an invaluable asset” and emphasized the need for further strengthening “strategic cooperation in all areas.” He added that the bilateral relationship “stands out as an excellent example” for ties between countries of different social systems. Pakistan and China have developed closer ties in recent years at a time of strained diplomatic relations between Islamabad and the United States. U.S. officials often question Pakistan’s commitment to fighting Islamic militancy on its soil, blaming these extremists for fueling the Taliban insurgency across the border in Afghanistan. Premier Li is visiting Islamabad nearly two weeks after Pakistan held its national elections. Mr. Sharif’s Pakistan Muslim League scored a resounding victory in the polls and he is due to become Prime Minister for a third time. Senator Mushahid Hussain, who chairs the Defense Committee of the upper house of the Pakistani parliament, told VOA change in the leadership in Pakistan has never come in the way of relations with China. China is Pakistan’s biggest arms supplier and provides it with financial assistance as well as much needed foreign investment. More than 120 Chinese companies are doing business in Pakistan and some 14,000 Chinese workers as well as engineers are working on different projects in the country. Bilateral annual trade rose to $12 billion in 2012 and both sides aim to take it to $15 billion within next three years. Beijing has also helped Islamabad establish three nuclear power plants while a fourth one is in the pipeline. 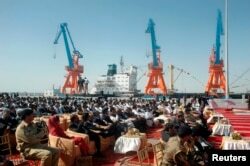 Earlier this year, China took control of Pakistan’s under construction deep-water Gwadar seaport that analysts say could serve as a vital economic hub for Beijing and a potential Arabian Sea naval base. During Premier Li’s stay in Pakistan, the two countries are expected to sign agreements related to energy, technology and space. Pakistani officials dismiss suggestions that a low-intensity rebellion led by Uighur militants in China’s far western Xinjiang region, which also borders Pakistan, has strained bilateral ties. Islamabad insists it is closely cooperating with Beijing to crush the insurgency and has killed or handed over several fugitive militants to Chinese authorities who had taken refuge in Pakistani border areas.